Seoul cafes: The solution to "food trash" in Korea - earth worming! 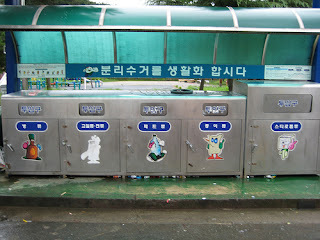 The solution to "food trash" in Korea - earth worming! In Korea, recycling in a necessity. Food waste is no exception. Our apartment complex allows us to throw our food trash out in a big bin - but soon, it will all change - so they say. The city has a new system coming up in place for residents to have their own "trash card" where they insert the card, the system/machine weights the trash - and then you will be charged per weight on the trash you discard. One of the ways I'm dealing with this "new system" whether it becomes the new system or not, is to grow my own earth worms! I was repotting a plant and came upon a few little earth worm guys - probably around 10+. After about 3 weeks of love and care, they are healthier and fatter than before! They were really barely moving when I first found them - but here they are squirming and fattening up! hide and seek , I see 2 earth worms! look at the size of this plump one! I was really unaware of how healthy and thriving they would become! If you have a few plants around the house and want a new pet, earth worms are great for their fertilizer and they're actually really fun to take care of(?) - they grow so fast! All I needed was a Styrofoam box, soil and earth worms - these all came free for me. I made no holes in the box and just open the lid a bit for air. I feed them once/twice a week. But I hope this change since they are growing and will eat more in the future. They've eliminated 1/4 of our food waste and that's not bad. I've already used their "poopy soil matter" (sitting on the very bottom of the bin) for fertilizer for our plants. Keep the box moist (about 60~80% humidity), enough that a bundle of soil will drip, but don't let it soak in water, it will drown the worms! When you feed their "food", make sure it's moist and cut up(not whole piece of lettuce). They prefer "chewed" particles over hard and fresh ones. I make sure to check their house every other day(vary) for moisture. I feed them about once a week. I have a "corner" in the box where I tuck in their food (cover it with soil). I keep the box open a bit at all times (avoid direct sun). Add crushed egg shells (when feeding) for pH balance - to prevent the soil from being too acidic - not good for the earth worms.